After a soccer game in the nof’east, we were famished. We were going to head over for our regular helping of pho/rice plate/vermicelli bowl, but as we passed Sabrina’s, we saw empty tables and decided to eat there instead. We got a lovely table outside and it turned out to be a great decision. It was in the shade and the weather was perfect. 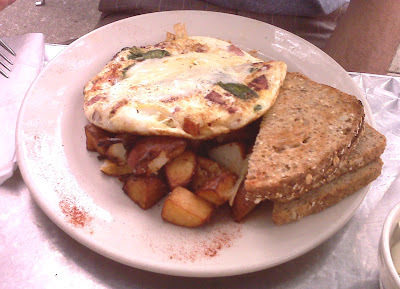 The egg white fritatta with turkey bacon. Mmmm… as good as the last time. These potatoes were amazing, crispy on the outside and fully cooked on the inside. It was pretty hot so I wanted something cold, or at least not hot. So I got the crispy fried tofu served with a soba noodle salad tossed in a peanut sesame sauce topped with mango salsa and thai chili dipping sauce. Whew, say that 3 times. 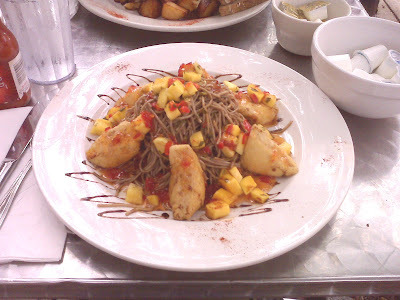 So basically, there was a bunch of soba noodles on a plate. It wasn’t really a salad as there were no greens on this plate at all. It came in a peanut sesame dressing. There was also some chopped mangos and sweet chili sauce was drizzled on top. The whole thing was great. Everything about this dish worked, all of the flavors, sweet, spicy, savory, it all melded really well together. Service was just fine. The server had a bit of trouble keeping the tables straight, as she got both the orders and the check mixed up between our table and a neighboring table. If you don’t have to wait, it’s a great spot for brunch. There’s a reason why it’s packed every weekend.